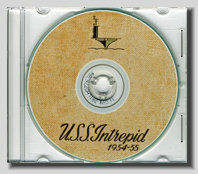 You would be purchasing an exact copy of the USS Intrepid CVA 11 cruise book during 1954. Each page has been placed on a CD for years of enjoyable computer viewing. The CD comes in a plastic sleeve with a custom label. Every page has been enhanced and is readable. Rare cruise books like this sell for a hundred dollars or more when buying the actual hard copy if you can find one for sale. Ports of call and Tours:Cadiz Spain, Gibraltar, Leghorn, Florence, Germany, Rome, San Marco, Naples, Pompeii, Capri, Genoa, Salonika, Athens, Valencia, Marseilles,Paris and Rhodes. Over 480 pictures and the Ships story told on 159 pages.